Mini-master wireless transmitter for Pyramid synchronized clock system. No cabling required, plug and play. Made in USA. Newest version. Ships in 24 hours. Up to 50,000 square ft coverage. Up to 2,500' radius range! Note: If you intend to run bells with this, stop now and look at the bundle packages. In order to run the Pyramid 5110 4 circuit or Pyramid 5300 signal circuit bell controller, you will need the Sync software, which is $695.00 additional. 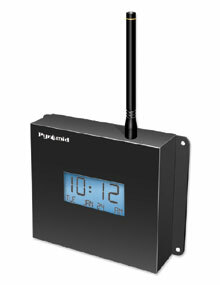 It is included with the Wireless Clocks In A Box Bundles.